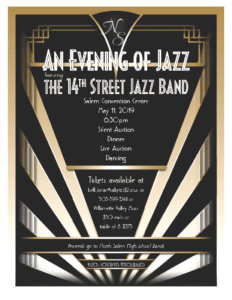 North Salem High School Band presents an Evening of Jazz featuring The 14th Street Jazz Band. The proceeds from this fundraiser event benefit all of the North Salem High School Bands. This is not your “run of the mill” fundraiser, included in the line up are: silent auction, live auction, dinner and dancing and incredible “Big Band” music performed by The 14th Street Jazz Band. To purchase tickets contact Brian Bell by email or phone: bell_brian@salkeiz.k12.or.us or 503-399-3241. Tickets are also available at Willamette Valley Music: 484 State Street, Salem. Open M-F 10AM to 6PM; Sat. 10AM to 5PM; closed Sun. Tickets are $50 each or a table of 8 for $375. 1920’s costumes are encouraged. The band program at North Salem High School is the oldest band program in Salem. Our band program under the leadership of Brian Bell, features the North Salem Vikings Marching Band, Wind Ensemble, The 14 Street Jazz Band, Basketball Pep Band and an advanced band program. This course is open to students who wish to study percussion literature and technique, including rudimental playing (marching band drum line), concert percussion (including tympanis), and mallet percussion. Enrollment is by permission of instructor. Rehearsals and performances outside of class time will be required. This course covers marching band and concert band. This course is open to all students who have taken Band and with the permission of the instuctor. Performances and rehearsals outside of class time will be required. This is an annual class covering both Marching Band and Concert Band seasons. This course is open to band/orchestra students interested in performing jazz band literature at a level commensurate with the ability of the group. Enrollemnt is by permission of instructor. Rehersals and performances will be required outside of regular class time. This is a yearl-long course. Students enrolled in Jazz Band must be enrolled in a large instrumental ensemble concurrently. This course offers a student the most advanced band training. It is an annual class covering both marching and concert seasons and is open to students by auditional only. Performances and rehersals outside of class time are required.